Of the short rows that sever’d my mental grip. You may recall me banging on about mentioning my disasterous first attempt at knitting a cardigan for DH’s 40th Birthday (coughcough in August ’07cough). Oh yes, who could forget that epic: the two-months of knitting; the episodes of running short of wool; the frequent trips to buy yet more; the kilometers of yarn; the production of something big enough for a Sumo Wrestler? I dubbed it “The Behemoth” with all the affection that name inspires! Why is it, when I make mistakes, they can’t be small, intimate affairs? They have to be bombastic productions with stratospheric repercussions. They say you learn from your mistakes. Perhaps my subconscious feels the need to SHOUT LOUD to get my attention. Learning from your mistake would involve doing the same thing, the same way – only better, because of all you’ve learned. Right? Of course not. This knitter has to do the same thing a completely different way and learn a whole new set of mistakes. I was inspired by my knitting hero, Elizabeth Zimmermann, to give it another go. Barbara Walker helped point the way: down-wards! and Aileen gave me the knowledge. With that knowledge came courage. I charted, I calculated and I measured my swatch (i.e. The Behemoth – at least it was good for something). I cast-on – provisionally – and started my top-down version of Debbie Bliss’ Glenvar pattern. Mistake #1 of my whole new batch. I call my second attempt “GlenvAargh!! !”, with almost as much affection. 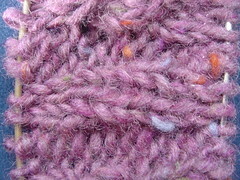 Mistake #1: You can’t knit up and down from a provisional cast-on in ribbing. At least, not without something “hookey” happening to the rib. I was aware of this but decided to lash on, regardless. The result is intriguing but I’m guessing no one’s going to notice. 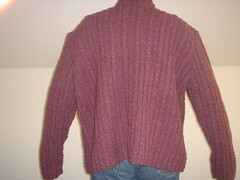 Mistake #2: Short-row shaping (for the sholders) and cables is not a great combination; it may wreck your head! I got through it and was happy with the result, mainly because I survived it. Mistake #3: This one is hard to explain – basically my calculations gave me 210sts around; the stitch pattern is based on 10sts; I planned to centre one repeat on the back and work the remaining 200 around. This meant the pattern repeat was not centred on the side seams. I decided this was fine and charted my way all around. According to my charts the front cables & ribs didn’t line up with the back. I didn’t realise that my charting was completely useless until I reached the underarms. Of course, the way the sholders were set up, the front and back cables and ribs have to line up. If I wanted to keep to the pattern I needed a stitch count of 200 or 220. Mistake #4: My first response on realising Mistake #3 was to opt for a stitch count of 200 and I rushed at joining under the arm-holes. Only then did I realise the impact this would have on the length of the armholes. Similarly, a stitch count of 220 would make them too long. GlenvAargh!!! went on time-out for a long time while I stewed over the repercussions. I couldn’t bear the thought of ripping again. The other day, a light went on. It was possibly inspired by fellow Knit-Knight (we meet in Swords, you see) Clare (a.k.a. Clarabel on Rav). She’s been knitting Mirage Pullover from More Big Girl Knits. I was very taken with how the lace pattern travels up the side seams and the underarm of the sleeves. I realised I could make a new chart for the side seams, based on 15 sts. Sigh of Relief: Aaaah! So, I got out my graph paper, pencil, rubber and stuck my tongue into the corner of my mouth as I charted my new territory; focused me. Then I ripped back the two rows to unjoin the fronts and back; fearless me. Then I realised that I’d messed up in my increases for the armholes, previously, so I ripped back another inch; determined me. I used a smaller needle to pick up the stitches as a life-line before I ripped; clever me. Something a little odd happened as I was ripping the back. I figured it out as best I could and knit on; brave me. Mistake #5 (yup, I’m not done learnin’ any time soon…) Pay more attention when something strange happens, even when you’re ripping. 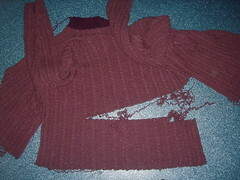 I’ve ripped out a short-row on the back and botched it up beyond all recognition. My short-rows are so good, even I can’t find them. All I know is the cable pattern is out of kilter – the first two repeats don’t need a cable twist for another two rows but the rest of the row is on the cable-twist row. GlenvAargh!!! is on time-out, for a third time, until I figure this one out. Oh! and while I’m at it: Mistake #101 – you can’t frog ribbing from the bottom up (as the wise lady says – ask me how I know…) The Behemoth bites me even as I slay it. Ouch!! That’s gotta hurt. Sympathy sympathy! It’s like a brave new world wrapped up in a jumper. Hurrah for soldiering on! me? I’d be delighting in its warmth as it toasted on top of a bonfire! PS you’ll be delighted to know that this pattern features in the new Debbie Bliss Mag to torment other poor souls. Oh dear poor you. Like Averil said I’d have hung, drawn & quartered that baby long ago, so kudos for sticking with it! Plus, when it’s finished you’ll be insanely proud of yourself!